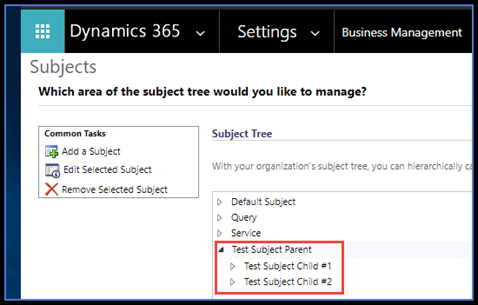 At times, you will find it useful to know which Dynamics 365 Processes (Workflows, Actions, Business Rules) currently reference a specified Subject(s) in the Subject Tree. This is especially true if you intend to rename the Subject(s) and want to keep the Process references accurate and up to date. There is a way to do this using the FetchXML Builder Plugin in the XrmToolBox utility. In today’s blog, we’ll walk you through how to do it. 1. You have the XrmToolBox tool with the FetchXML Builder Plugin already installed on your computer and have created a connection within XrmToolBox to your Microsoft Dynamics 365 Org. 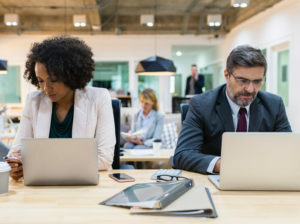 For information/documentation on downloading and installing XrmToolBox, connecting it to your Microsoft Dynamics 365 deployment, and adding XrmToolBox plugins, go to Download XrmToolBox. Now you want to identify all Processes that reference the highlighted Subjects from the Subject Tree. 1. First, in your D365 Org, open the Advanced Find tool. 2. Create an Advanced Find query (look for Cases entity) where the Subject field is equal to Test Subject Parent and click the Download Fetch XML icon to generate a FetchXML file of type ‘XML Document’ in your Downloads folder. 3. Find and open the downloaded FetchXML file with Notepad or another preferred Text Editor tool. In this file, take note of the Test Subject Parent‘s globally unique identifier (GUID) that is embedded in the FetchXML. Be ready to copy the GUID from this file for a later step. 4. Repeat Steps 2 and 3 for Test Subject Child #1 and Test Subject Child #2. 5. Now open the XrmToolBox utility and Connect to your D365 Org. 6. Open the FetchXML Builder Plugin by clicking on Plugins, then on the FetchXML Builder icon, and then on the Continue button. 7. Once FetchXML Builder is open, in the top left Query Builder pane, right click on the fetch top:50 query statement. In the bottom left Quick Actions pane, you can change the value for Top to indicate the maximum number of rows you want returned from the fetch, but 50 will work for our purposes, as the number of Processes we are trying to find is far less than 50. 8. 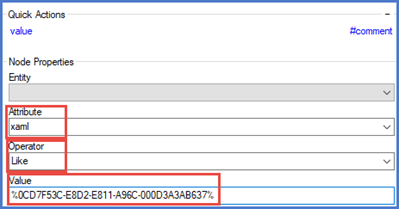 Next, in the Query Builder, click on entity. In Quick Actions, select workflow in the Entity name dropdown. 9. In Query Builder click on entity workflow. In Quick Actions click on attribute. 10. Now go back to Query Builder and click attribute. 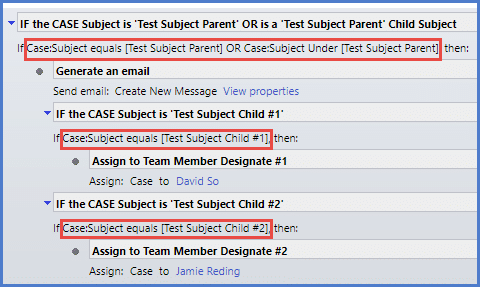 In Quick Actions select name in the Attribute name dropdown. 11. Click again on entity workflow in Query Builder. In Quick Actions click on filter. 12. With filter still selected in Query Builder, click on condition in Quick Actions. 13. With condition still selected in Query Builder, return to the Quick Actions pane and select xaml in the Attribute dropdown and Like in the Operator dropdown. Now copy the GUID in the FetchXML file for Test Subject Parent (noted in Step 3). Place it into the Value field between two “%” characters. 14. Select filter once again in the Query Builder query structure and again click on condition in Quick Actions (this is done just as shown in Step 12). 15. 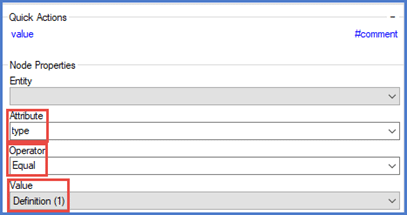 With a second condition now placed into and still selected in the Query Builder structure, go to the Quick Actions pane and select type in the Attribute dropdown, Equal in the Operator dropdown, and Definition (1) in the Value dropdown. 16. The query is now ready to run! You can use the Save button to save this query for future use – the Open button will allow you to browse to it and open it again when you reenter FetchXML Builder at a later time. At this time click the Execute button or F5 key to run the query and see results in the Result View pane to the right of Query Builder. Per our Process definition (assumption #3 above), the three Processes listed (one Action, two Workflows) all referenced the Test Subject Parent Subject. Note that you can easily repeat these steps for any Subject for which you want to find the Processes that contain a reference to it. That’s it for today, readers. For more information on Dynamics 365 and other useful tips, feel free to contact us! Also, make sure you check out our blog weekly for the latest news and educational materials. Happy D365’ing!